2Place the skinless & boneless chicken thighs on a baking tray & pop them in the oven for 20 minutes. 3Whilst the chicken cooks you can make your Mexican rice! 4In a large pan add a little oil and fry your finely diced onions with & a pinch of cumin & chilli & fry for a few minutes. 5Now add the uncooked rice and stir until the rice is fully coated in the oil. 6Now add the chicken stock cube & pour over boiling water until it just covers the rice. 7Reduce the heat & allow this to simmer for 20 - 25 mins or until the water has been absorbed by the rice. 8Finely stir in the frozen sweet corn, finely diced tomato & a pinch of salt & pepper. 9Your chicken should now be cooked, so remove it from them oven & set aside. 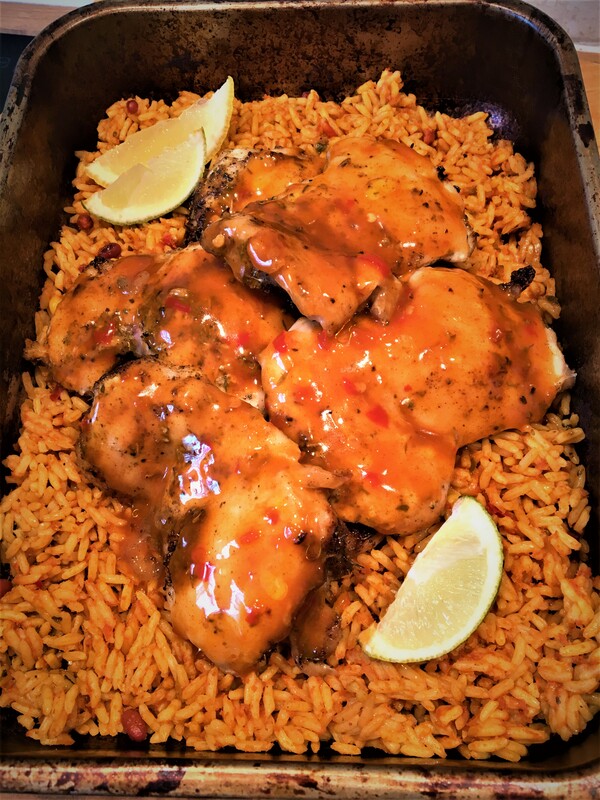 10To serve I like to lay out the rice on a platter, place the chicken thighs on top & finish with the secret ingredient to this recipe - Blend Bros incredible sugar free Peri Peri sauce! 11Allow at least 1 tablespoon of sauce per chicken thigh, with a little extra on the side for good measure. 12Finally, don't forget to serve it with wedges of fresh lime!